Following the Turkish war of Independance, 1920-22, Turkey rearmed with Czech model 98/22. This rifle was based upon the Mexican Model 1912 was the first rifle adopted for service with the Czech army. 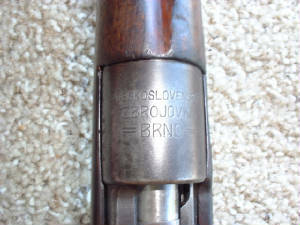 Manufactured from 1924 to 1930 by the BRNO Arms Works (Czechoslovak State Armament Works, BRNO) in Czechoslovakia. 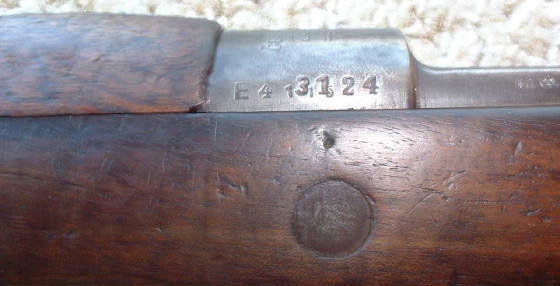 Turkey re-numbered the rifles hence the double serial stamp. There is also "N.A. CO" stamped on the left side of the receiver. On the right side "CAL 8mm TURKEY" is stamped. There are no other Turkish symbols apparent. The receiver and sight numbers match, all others random. 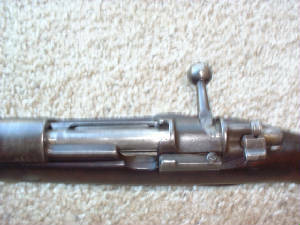 The gun is in good shape, 50% of the receiver blue existing, barrel has very little. Not much rust damage and the bore is decent. The stock is in good shape no splits and has bot been refinished. "Mauser Military Rifles of the World"